A RUSSIAN PLANE loaded with precious metals lost its glittering cargo on take-off, scattering the runway with gold and silver. The Antonov plane was taking off after refuelling in an airport at Yakutsk in Siberia when its cargo door flew open and out tumbled nearly 200 bars from the Kupol gold mine in the remote Chukotka region, investigators said. 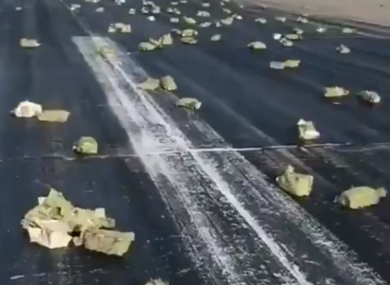 “As it gathered height, the cargo door became damaged due to the shifting of cargo” and “part of the cargo was scattered on the runway,” Russia’s Investigative Committee said in a statement on Telegram. The plane was forced to land back at the airport, and police immediately sealed off the area to prevent locals from rushing to the scene of the rare windfall, Yakut media local news site reported. Email “Over €300 million worth of gold spilled onto a Russian runway after a cargo plane shed its load”. Feedback on “Over €300 million worth of gold spilled onto a Russian runway after a cargo plane shed its load”.